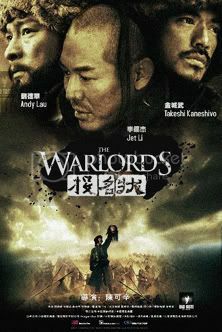 The Warlords, previously known as The Blood Brothers (simplified Chinese: 投名状; traditional Chinese: 投名狀; pinyin: tóu míng zhuàng), is a 2007 Chinese/Hong Kong martial arts/drama film directed by Peter Chan and starring Andy Lau, Jet Li and Takeshi Kaneshiro. The film was released on 13 December 2007 simultaneously in most of Asia, except Japan. The film is set in the 1860s, during the Taiping Rebellion in the late Qing Dynasty in China.